The use of commercial networks in public safety has been a hot topic recently. Many countries have introduced concepts to offer public safety connectivity with variable results. One hot topic in how to use commercial networks is to utilize multiple networks at the same time. The reason for this is a natural reasoning since one commercial network occasionally has capacity problems: let’s combine many to always provide a good broadband solution. However, this reasoning lacks the understanding of the basic functionality of how mobile networks function. This misunderstanding has led to bad results in tests and occasionally to abandon the concept of using commercial networks for this critical user group. What is it we’re talking about, really? First it is important to understand the terms. We need to differentiate load sharing from link aggregation or “bundling” as often referred to. Load sharing sends different data streams to different WAN links and “balances” the load between the links. It either sends always different types of traffic to different links or works with and “water flow” principle when one link is full using the second one. The problem with this is that the data sharing is application based and individual application cannot be distributed over multiple links. Usually only one application, live video streaming requires the capacity that would need multiple links. This problem cannot thus be resolved with lead sharing. Aggregation or bundling builds one “big pipe” of data over multiple links. This enables all individual applications to treat all combined links as one. The challenge comes from when one link is cut off; the whole aggregated frame needs to be built again. One big hinder in this solution is the extremely dynamic nature of mobile data networks. Aggregation can with current technology only give always only X times the worst link capacity, X being the amount of links! Let’s look at these challenges more closely. The first challenge is to consider what is the criterion to share the load? Are we just having two times normal links with separate and dedicated data for each link? Or are we using some kind of “water fall” approach with filling one link first and then directing the overflow to the other links? 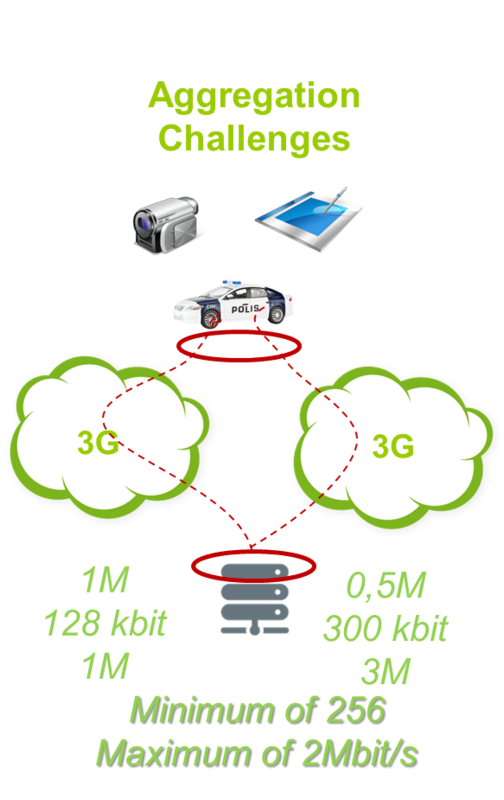 With dynamic mobile networks in moving vehicles the network throughput capacities change constantly. To suit the correct amount of traffic into each link and then changing traffic between links when capacities change create problems. With load balancing approach it is impossible for any router to share the traffic over multiple links unless you have multiple VPN tunnels. IP address - based load sharing would then only be possible with multiple VPN’s and the solution would be limited to “best effort” type use. Most importantly: if an application demands more that the primary link, it cannot be shared. This means that live video streaming would not work. For live video streaming the aggregation would be the logical solution. Link aggregation enables capacity sharing over all links. The joint delays are always at least at the level of the worst link used. All link interruptions need a new build for the whole frame and this would need to happen all the time, even hundreds of times a day. This creates even more delays since the rebuild of the frame needs time. It is common to have some kind of a connectivity break in any network every few minutes over any of the used links. The rebuild of the aggregated stream is always depending on the latency of the worst link and it is thus very difficult to use interactive communication like VoIP or video conferencing due to continuous and frequent delays. The ITU standard defines the minimum one directional latency for voice to be at the most 150 ms. This can very seldom be reached with network interruptions in aggregated solutions. Additionally aggregation always needs a dedicated back-end system that can be very expensive due to large number of needed logical ports. What is then the best solution? Let’s consider the possibility of having a system where the link quality is always tested and the best available link would always be used. This would mean following capacities. Fast switch from network to another in this case provides always better capacity than link aggregation. The similar would apply to load sharing, since the allocation of capacity due to very dynamic environment disables the allocation to its full extent. This means that one demanding application, like live video streaming cannot be used over load sharing over multiple links and the framing of the aggregated data stream creates delays and cannot utilize the best capacities of the available networks. There is evidence that supports this statement. 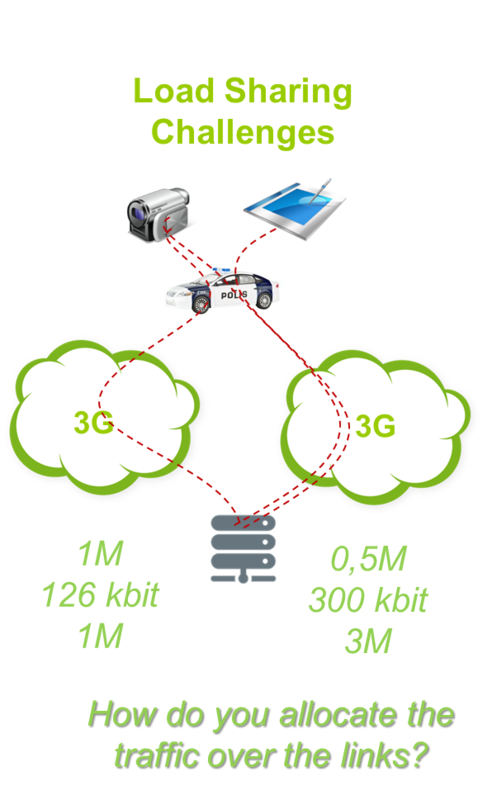 With a test in Scandinavia a solution with 5 aggregated 3G links was able to give only 700 Kbit/s capacity despite the existence of 3G networks. If any of the links was occasionally using Edge capacities, this would mean 5 X 128 Kbit/s approximately. Simultaneously there is several HSPA+ or even LTE networks available with multiple Mbit/s over any single link! A suitable option would thus be something like presented in the picture below. This scenario requires a capability to monitor the link quality and cautious proactive switching between networks. The first tests of this approach have been leading to implementations with high-end applications like VoIP and live video. Modern networks are developing and growing fast and the capacity over one link is often tens of megabits per second generally. This is enough for all current modern applications including live video streaming, VoIP and combinations of these. Using multiple networks with always selecting the best one gives very short delay times. With quick switch over from network to another one can reach the best overall link quality, availability and resilience. Load sharing and aggregation seldom meet the requirements for public safety mobile broadband data. Proactive selection of best mobile link is thus currently the Best in Class solution for applications that demand uninterrupted broadband connectivity.